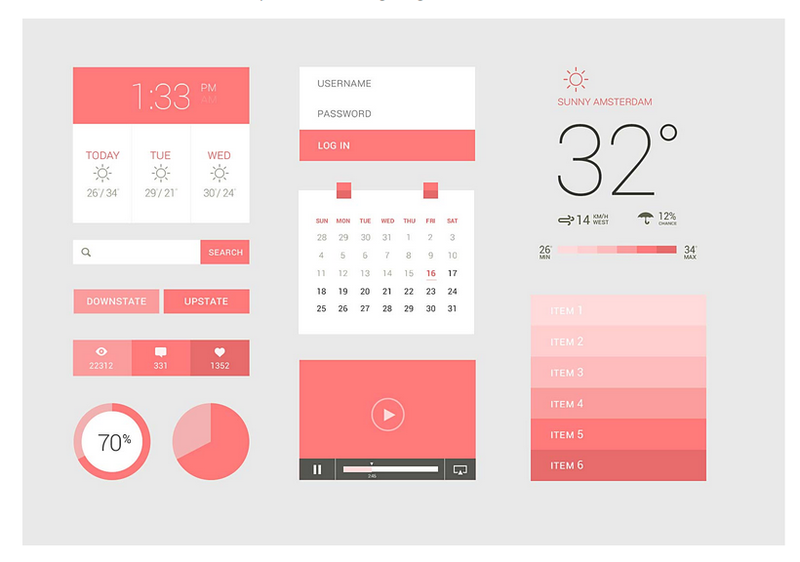 Which color scheme to choose for applications that require long work hours? I'm working on a ERP / Accounting (lots of tables and data) web app and was wondering what color scheme would be appropriate for this type of application? Users will be sitting in front of their computers for 8+ hours enetering lots of data on daily basis and I would like to make that experience as comfortable as possible to their eyes. Most of these application I've seen are using some sort of a white/grey/blue scheme with white being dominant but I'm concerned that this color might strain their eyes to much especially considering different brightness of monitors and working in the dark. Light grey text on a white background and small text size both lead to an increased orbicularis oculi activity and decreased blinking. These two conditions are related to text quality, and we would expect to find similar indicators of eye fatigue with poor font quality or condensed letter spacing. For examples of good color combinations with sufficient contrast I recommend reading this article on UX matters which has this to say on what contrast to choose for minimal eye strain. For backgrounds behind text, use solid, contrasting colors, and avoid the use of textures and patterns, which can make letterforms difficult to distinguish or even illegible. 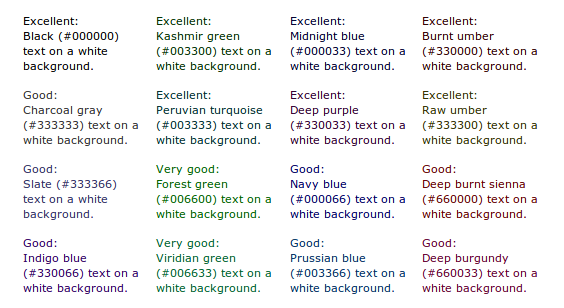 Choose combinations of text color and background color with care. Value contrast between body text and its background color should be a minimum of about eighty percent. To provide the best legibility, ensure that text contrasts adequately with its background in both hue and value. When there is insufficient contrast between the hue or value of text and its background color, the text appears blurred or has a halo effect around it, making it difficult to read and resulting in eye strain. Designers usually try to use high quality text when readers are expected to read for any period of time, but using a comfortable text size is not always possible. In print, there is a trade-off between type size and the amount of text that can fit on a page. Nine-point type may be chosen because it is cost-effective, whereas eleven-point would be easier to identify visually and would reduce eye strain. Twelve-point text may be needed for good character definition on computer screens, because readers frequently sit further from a screen than from a printed page, but many Web pages specify small font sizes despite the fact that it costs no more to create additional or longer pages. Designers need to argue for larger text sizes to reduce the effects of eye strain. Incidental: Text or images of text that are part of an inactive user interface component, that are pure decoration, that are not visible to anyone, or that are part of a picture that contains significant other visual content, have no contrast requirement. Logotypes: Text that is part of a logo or brand name has no minimum contrast requirement. You should also considering offering a high contrast option which will allow users to work comfortably in low light situations. 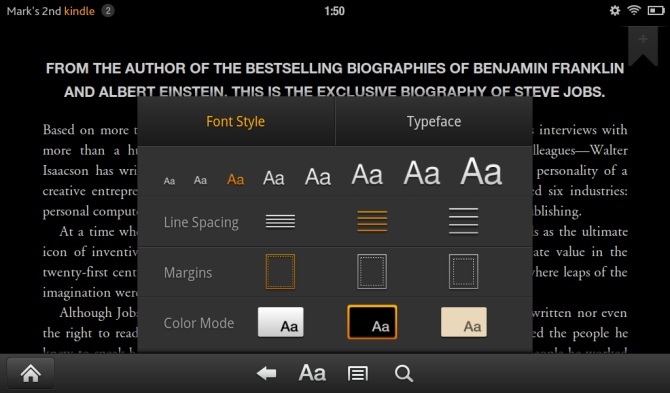 It would be a good idea to provide multiple options like how kindle handles it as shown below. However, using light text on a dark background also has its advantages for attracting less light in a dark room. When reversing colour out, eg white text on black, make sure you increase the leading, tracking and decrease your font-weight. This applies to all widths of Measure. White text on a black background is a higher contrast to the opposite, so the letterforms need to be wider apart, lighter in weight and have more space between the lines. “On a sunny summer day I love to read a book outside. Not right in the sun; that’s too bright. I’ll hunt for a shady spot under a tree. The shaded paper contrasts with the crisp text nicely. If you were to actually measure the contrast between the two, you’d find it is much lower than black text on a white background (or white on black) on your display device of choice. Black text on white from a computer display is akin to reading a book in direct sunlight and tires the eye. Solarized reduces brightness contrast but, unlike many low contrast colorschemes, retains contrasting hues (based on colorwheel relations) for syntax highlighting readability.” White-on-black themes, popular among developers who want to reduce eye strain, are an improvement over black-on-white themes, but the contrast is still far too great. While working on a data intensive project management app recently, I opted to use a light grey background (#f3f3f3), white (#fff) "cards" with a very subtle box shadow, and light-black (#333 of #585858) text on the cards. The area the user needs to read stands out, but is still white. The contrast between the text and the background is easy on the eyes. For links and other colors, I used "pastel" type shades so it's not too dark and not too bright. I got this idea from looking at webapps like Google+, LinkedIn, Podio, and more. 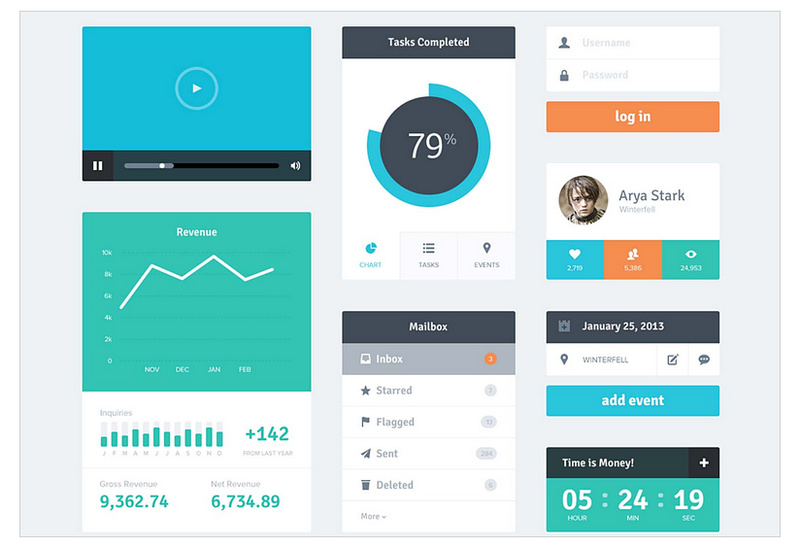 Check out these UI kit screenshots - it seems like this trend is quite common. The question is: is this a trend or actually better for users? In my experience (taking a webapp that had darker elements and an all white background and then making it "flat", adding the grey background and "cards") this seems like a better route. 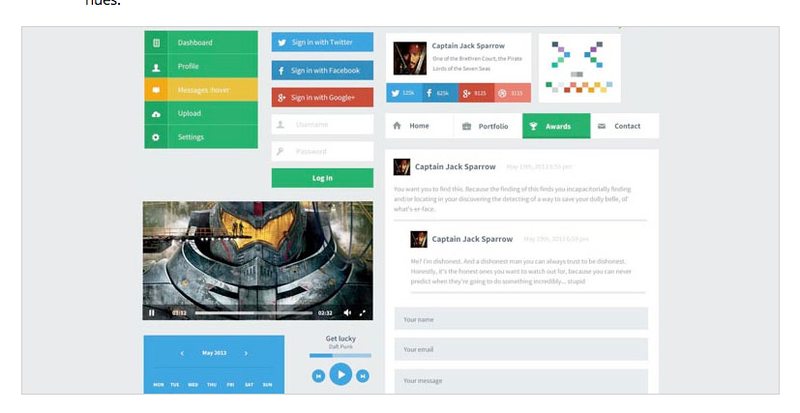 This is based on feedback from users using the app heavily before and after the redesign. 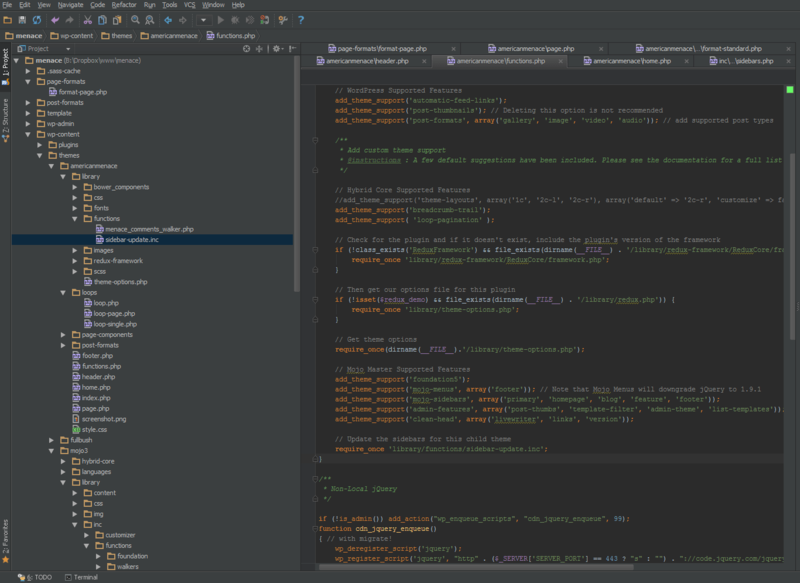 The JetBrains Darcula theme has been exceedingly popular as it is both high contrast and desaturated. You can offer a similar option in midnight blues that is equally pleasing on the eyes. Note that we throw out the top and bottom 20% of the brightness scale as well. Would I read a novel like this? Probably not. 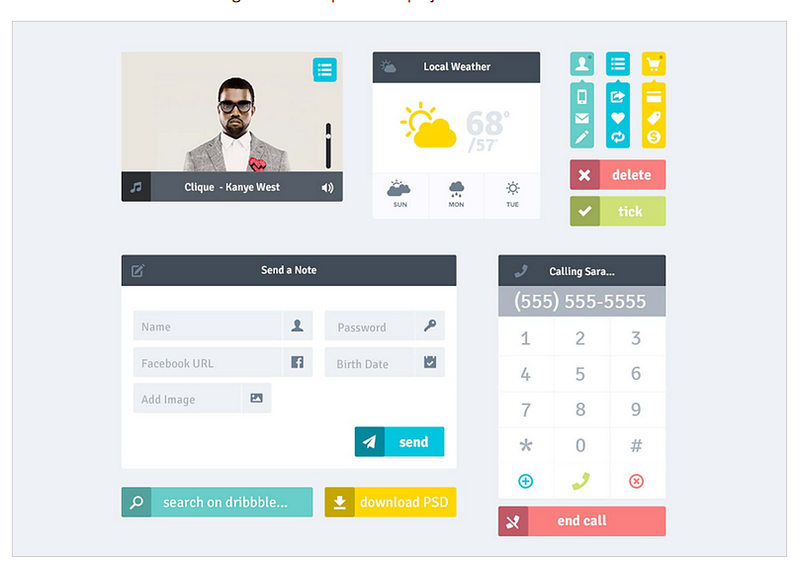 This style of interface is great for digesting blocks of information for hours on end. It's awful for paragraphs. Light grey and other light shades on white or another light color are purely evil for some of us. I simply can't read it. Ask some older folks to check your choices on a variety of monitors before feeling everyone should just love licorice-exlax ice cream just because you think it tastes great. It would be nice if people would try these combinations on a variety of monitors without tweaking to see that what is acceptable on some, is actually non-existant on others. I was actually blown away when I saw that one of Google Maps' decontrasting moves actually had roads on some monitor setups. I personally would fail about 3/4 of the images avi posted above as being too much strain to bother. Not the answer you're looking for? Browse other questions tagged gui-design web-app color-scheme or ask your own question. Dark or white color theme is better for the eyes? What is the best color combination for on screen reading? Why do most financial apps use a black or dark background? Mobile app considering ecology - is it possible to blend light green into calm scheme? Does a color scheme that reduces brightness contrast while maintaining hue contrast reduce eye strain? Which colour to choose for 'updated' field? 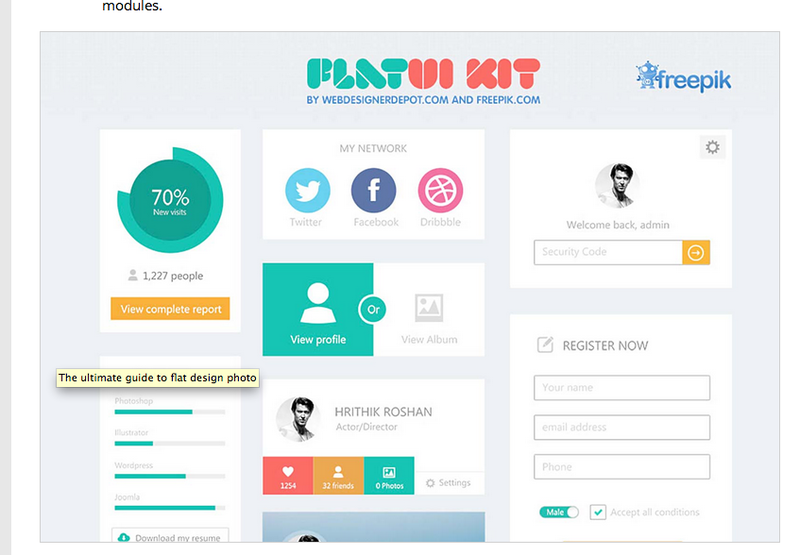 Bootstrap nav bar with variable background color - best way to handle this?